My experience with Vietnamese transport is not the best. 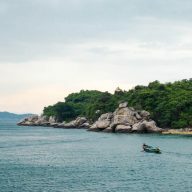 A few years ago, during my first trip to Vietnam, I took a bus from Dien Bien Phu to Hanoi. It was one of the worst journeys in my life, so when Chris asked me if I wanted to go from Da Nang to Hue by train I was a little reluctant. However, it was supposed to take only 3 hours and I thought that I could last a couple of hours on a train. A day before our departure we tried to book tickets online on various sites, but our cards were declined every time. 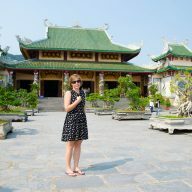 The next day, in the morning, Chris drove to the train station in Da Nang and bought tickets there. It only cost us 75,000 VND each one way (around $3) and we could book return tickets as well. 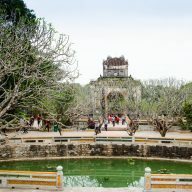 We had decided to stay only 1 full day in Hue and booking the return journey in advance was saving us time and energy. Since then I have been using 12 Go Asia for all my trips around Asia. It actually could have saved us a lot of time, but we didn’t know that then. With 12Go Asia you book your tickets online and then collect them either at the station or at a tourist office near the station. It’s a very straightforward process. 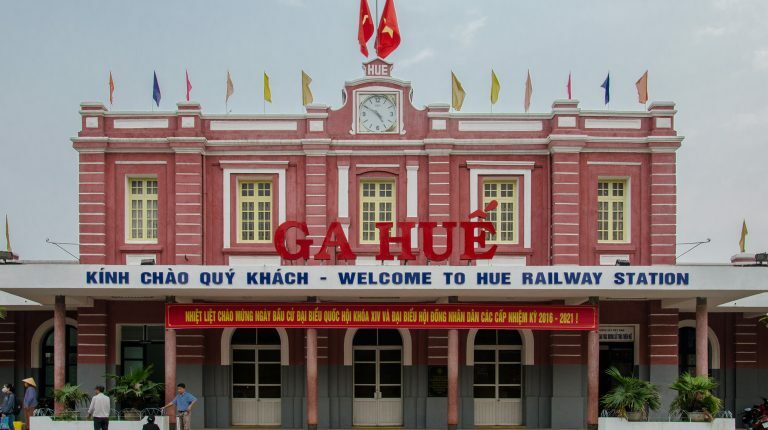 If you’re going to Hue by train, I would recommend using that site to buy your tickets. The train station in Da Nang is small and a bit overcrowded. 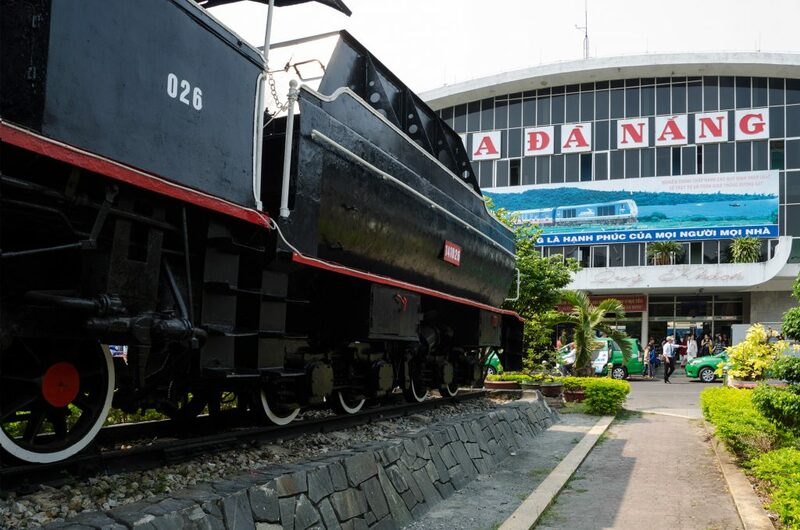 A big, old locomotive, surrounded by flowers and green bushes stands outside the big concrete building, making the station look a little bit more pleasant. Inside there are a couple of small shops with snacks and you can find some hot dishes and banh me outside, too. The building has a few small air-conditioning units, which don’t really help with the heat. However, there are enough chairs around to sit and make the wait a little bit more bearable. The ticket counters are located further down in the building. If you would like to purchase the tickets you need to pick up a number and wait for your turn. The ladies, selling the tickets, don’t really speak much English, but it’s enough to make a transaction. We arrived way before time and sat down in the waiting. I was making a polite conversation with an English lady in her 50s that was travelling alone from Saigon to Hanoi (a big ‘yey’ to travelling women!). When there was an announcement in Vietnamese and people started moving I realised that we didn’t have any idea which train to get on. A small screen, hanging over the counters, showed train numbers and times of departures, but I couldn’t see our train on there. People started queuing, so we decided to queue too and ask the station staff if that was our train. A few minutes later a big train, similar to the ones we have in Poland, arrived and we were shown the way to our carriage. 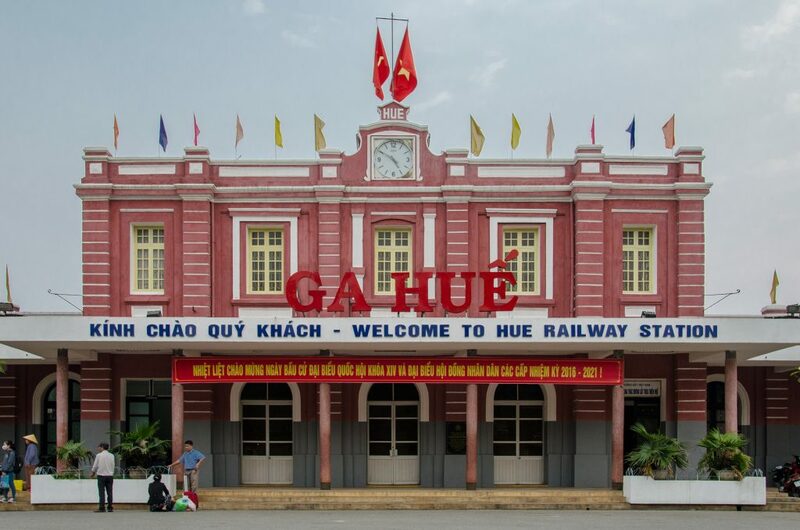 There are a couple of options to choose from if you want to travel from Da Nang to Hue on a train. 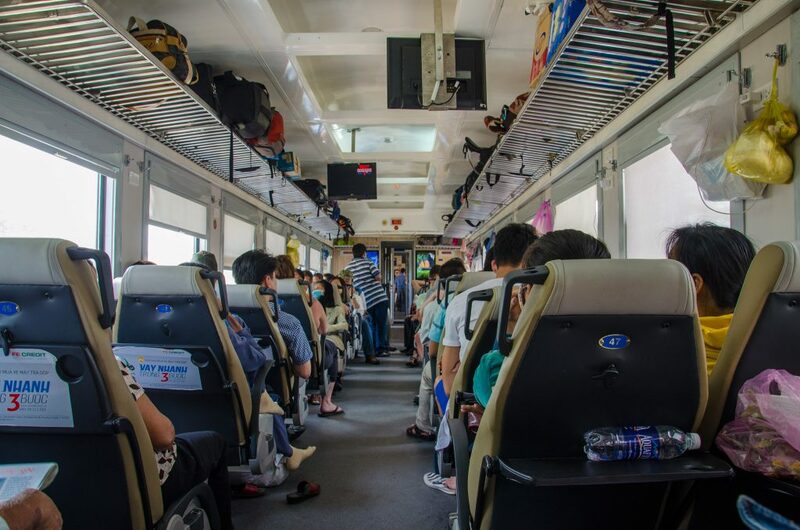 The cheapest option is a hard seat in a non-air-conditioned carriage, which costs from 40,000 – 46,000 VND ($1-$2). You can also opt for soft seats with air-con from 60,000 VND ($2,70), or a hard bench with air-con for 85,000 VND ($3,80). Finally, there is the soft bench with air-con for 89,000 VND ($4). The prices vary depending on the time of the day and which day of the week it is. We chose the middle option – soft seats with air conditioning. The seats were very comfortable with a lot of leg space. The carriage was quite clean. Here and there you could see some rubbish left by the previous passengers, but that happens almost everywhere. Most of all, the temperature was bearable. I noticed that Vietnamese are not so crazy about air-conditioning as Thais and they try to keep their public spaces cool, but not freezing. The carriage was also equipped with a small tv screen, which played some Discovery Channel documentaries at the end of the journey. The food and drinks were sold from small carts, which appeared every now and then. Unfortunately, the toilet didn’t leave a good impression on us. I experienced some stinky ones in my life (I will never forget the ones at Glastonbury), but the one on the train from Da Nang to Hue took my breath away (quite literally). Except that, everything went very smoothly. There were no delays and I really enjoyed the trip. And the best part? The views! The rail track goes over the ocean and through high cliffs and I couldn’t stop but stare out the window all the time. We passed some great hidden beaches. One couple obviously thought they wouldn’t be disturbed and decided to go skinny dipping on one of them. We were just passing by and watched them from far away, but we could tell that they were very surprised by the presence of a train full of people. 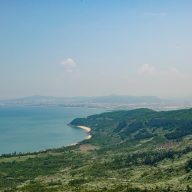 If you happen to sit on the opposite side of the carriage, then you won’t be disappointed either as you can watch the beautiful Vietnamese countryside. The views are equally stunning. We arrived in Hue on time. I was pretty impressed by the experience. My memories of the hellish trip from Dien Bien Phu started to fade away. Two days later we were waiting for the train to go back to Da Nang. 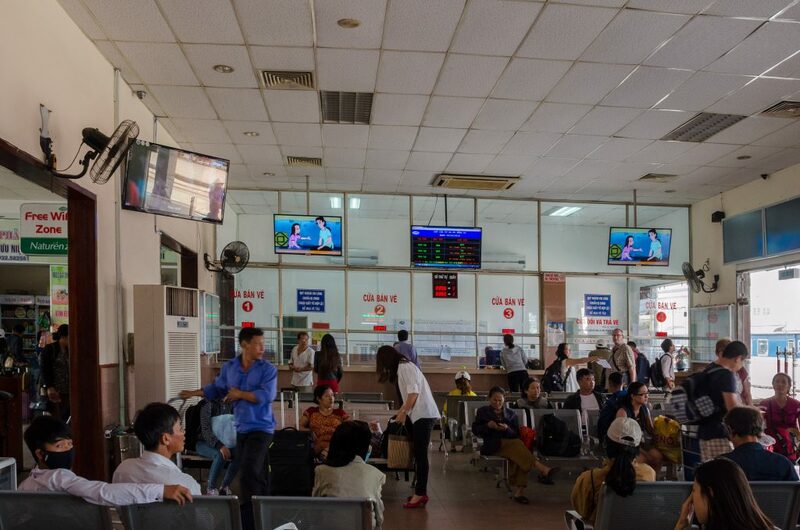 The train station in Hue is a little smaller with a waiting room and ticket counters. It does resemble the one is Da Nang. Here you can also purchase drinks and snacks, or eat something more fulfilling at the opposite side of the street. As it turned out it was delayed almost 2 hours. There were announcements made every half an hour or so, but everything was in Vietnamese. Luckily, every now and then someone from the train staff that could speak English was passing us by and informing us of the current situation. When we arrived in Da Nang we were straight away asked if we wanted a taxi. It was supposed to cost $1 – a pretty good price, comparing to $5 we had paid to get from home to the station. When we walked with the driver to his car he started asking us how long we would stay in Da Nang and what we were planning to do. When he found out that we were living here and had our own scooter, and after we politely refused his offer of driving us to tourist attractions, he simply waved us off and left us. He must have thought that driving to the other side of the city for $1 was not worth it. 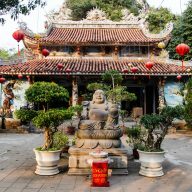 If you happen to arrive in Da Nang and want to get a taxi, it is best to walk a bit towards the main street and then catch a taxi from there. This way you won’t have to haggle and argue with the aggressive drivers at the station. Taking a train from Da Nang to Hue is a pleasant experience. Don’t forget to have your camera ready to snap photos of the beautiful views.